Why waterproof pool decks? It’s concrete, surely it should be able to handle a bit of water, right? That slab of concrete may seem awfully tough but it is more vulnerable than you think. Here’s why you need to waterproof your pool deck. One of the most common signs of wear and tear on a pool deck is the appearance of cracks. Water causes erosion. Every splash or drip that seeps into the crack is making the problem worse. It happens so gradually you don’t notice. A few years later you suddenly notice that a seemingly inconspicuous crack is a massive eyesore. But the problem is much greater than just aesthetic in nature. The bigger problem lies where the water from those drips and splashes finally ended up. In addition to water eroding a crack into a bigger problem, there is weather. It’s not just rain that will exacerbate crack issues, introducing more water and resulting erosion. During cold weather months, when you practically forget about your pool altogether, invisible happenings are going on right under your nose. As temperatures drop, concrete contracts. That means a crack gets bigger. If it rains during periods cold enough to freeze the humidity, the moisture that enters the crack freezes and causes more damage. When Spring rolls around and you begin thinking about getting the pool ready, you most likely are in shock, wondering where that big crack came from. Well, most likely it was there all along, growing bigger very slowly. You had become so familiar with it, that in order for you to really stand up and take notice you had to ignore it for a few months then return with a new perspective. And while you were away it was growing bigger and causing other problems down below. As water seeps under the slab through cracks and crevices it begins to affect the underlying soil. When your pool was constructed, builders worked very hard to pack the soil firmly and create a solid, level plane for the pool and deck to settle on. Now that soil is getting moist, soft and weak. It is going to become more difficult for the soil to provide support as it was designed to do. So now your deck and pool are in double trouble because of a tiny crack. The integrity of the slab is compromised with points of weakness wherever a crack is present. Its underlying support system is weakened from the moisture seepage through the cracks that have softened the soil. By now, everything may have begun to shift. If you don’t want to end up with a worst case scenario like a tilted foundation and pool, waterproof you deck. By applying a concrete coating to the surface of your deck you are doing more than protecting the integrity of your pool’s design from water damage. Many other benefits are tied to a deck’s waterproofing system. The exterior nature of a pool deck exposes it to much more than water from the pool or rain. UV inhibitors in the formula of a waterproofing system can offer protection to a deck from its constant exposure to the Sun. Wind can also have a corrosive nature to concrete over time, blasting sand particles across its surface. A rubberized protective membrane shields the surface of your deck from the damaging effects of water, sun and wind. Waterproofing your pool deck won’t just protect the structure, it will also help protect the people who are enjoying the pool. Injuries from slips and falls by barefooted bathers on wet pool decks are common. A rubberized coating on the surface of the deck creates a safer environment with non-slip abilities. To learn more about waterproofing your pool deck, please contact us. 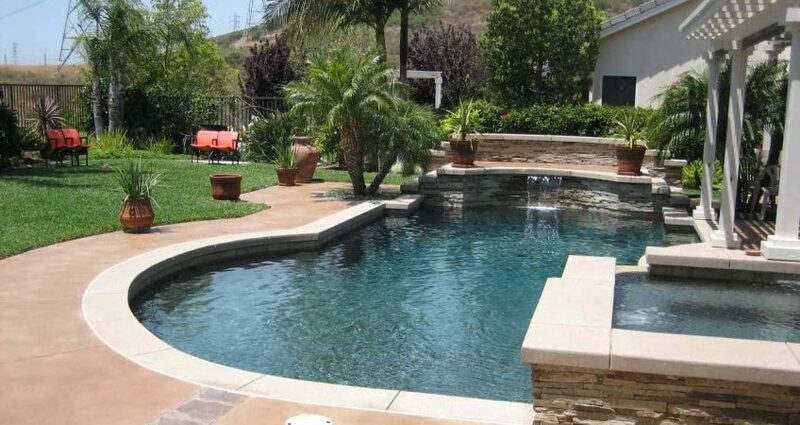 Our experienced professionals can help you select the best products to enhance the life of your pool deck. With nearly 40 years of waterproofing experience, our certified applicators can help you plan your project so that you can enjoy your pool for years to come.